My long time hunt for the perfect pair of denim cut offs has officially come to and end. It was love at first sight with this pair and I can officially say they're pretty amazing. The length, distressing and boyfriend fit is exactly what I've been searching for. I paired them with a basic black tee and white chucks for an easy, classic look, but the outfit possibilities are endless. P.S. - If you're wondering about the fit - they run large, so size down. I love these shorts, I must have them this summer. 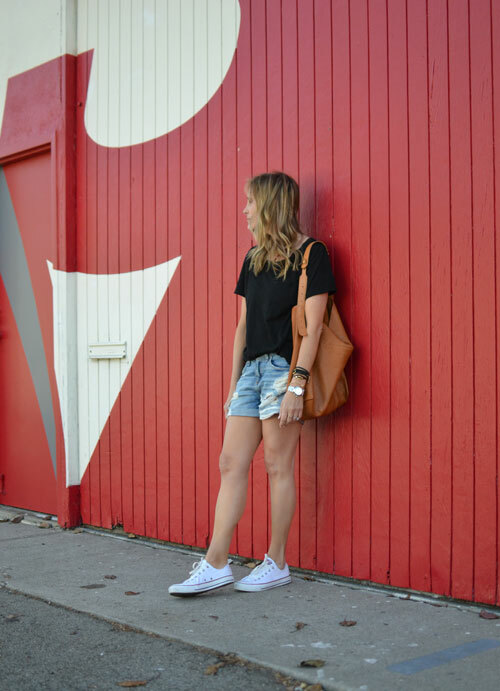 LOVE those rag and bone shorts! I need them! I had to snag them as well! Aren't they amazing? Love the Rag & Bone shorts! I actually posted the same pair on my blog post today about Transition Denim! Great minds really do think alike as they say! © Casual Glamorous 2011-2016. All Rights Reserved. Powered by Blogger.